Tim Cook’s position as the Apple CEO was not always as unstable as it currently is. In October 2012, he had the backing and the courage to fire Scott Forstall, the celebrated designer of iOS. While the precise reasons for the sacking were never quite made public, we here try to zero in on a few probable causes. Refusal to take the blame for the Apple Maps fiasco – The official Apple Maps app for iPhones is still far from being perfect – but they were unmitigated disasters at the time of their initial release. To calm down enraged buyers of iOS 6 devices, Apple had to issue a public apology letter. Forstall, however, refused to sign the letter – and the whole in-fighting was brought to light at a press conference. After that, Apple and Forstall could not coexist. Alleged lack of collaborative abilities – Tim Cook has repeatedly emphasized on seamless software-hardware collaboration as a key element for coming up with innovative mobile solutions. It was said that Forestall did not quite fit the bill in this regard. 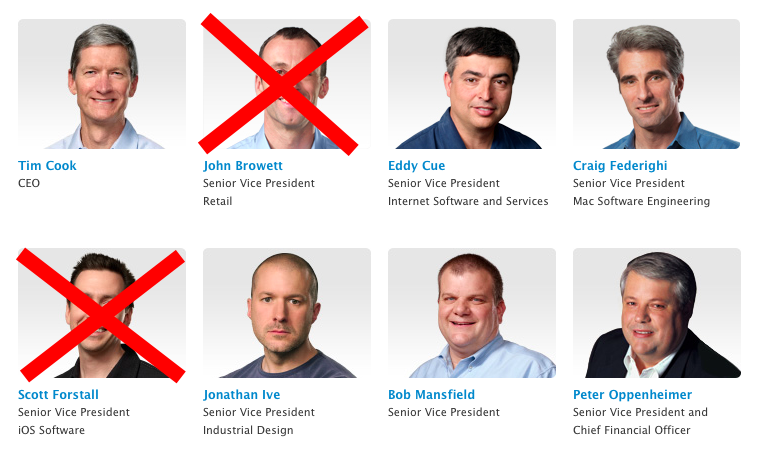 At the time of the sacking (in October 2012), Cook compared Forstall unfavorably with Jonathan Ive, Bob Mansfield and Craig Federighi – three of Apple’s all-time greats. Officially, Scott Forstall’s lack of finesse as a team-player led to his doom. Attitude problems – It’s not only the current Apple CEO who has been downsized in comparison with Steve Jobs. Similar comparisons were done between Jobs and Forstall too, with unflattering remarks being hurled towards the latter. The problem was, Forstall took all these brickbrats too personally, and grew increasingly gruff and rude-behaved with his colleagues. Ironically, Tim Cook often had to oversee Forstall’s meetings with other Apple executives. Finally, Cook decided that enough was enough! Unflinching loyalty to skeuomorphic designs – Many general iPhone-users as well as experts from mobile app companies have opined that the appearance of iOS 7 is a tad too flat – compared to its predecessors. The prime reason behind this is the departure of Scott Forstall, who, much like Jobs, believed that mobile OS designs needed to have a touch of skeuomorphism (additional design elements and visual cues) – for them to appeal to users. Tim Cook was dead against the concept, and had already expressed his desire to take Apple out from Jobs’ influence. Hence, Forestall was ousted – and the ideas of Steve Jobs received an unpleasant farewell too. Forstall’s bullying tactics were not tolerated – Make no mistake – Scott Forstall was a genius in his own right, but he was also a big bully at the Apple headquarters. His co-workers often complained about being sidelined in projects headed by him – or worse, getting publicly rebuked by him. Reportedly, Forstall had a tendency to claim credit for others’ achievements too. No one can be bigger than a $160 billion company – and the ouster of Forstall was a reminder of that fact. The Siri disappointment – Every iPhone enthusiast was intrigued when Scott Forstall initiated the concept of Siri, for iPhone 4S. It was supposed to be a flawless digital assistant, providing quick, useful and insightful answers to every question that users might have. Things, unfortunately, did not quite go according to plan – and many felt that Siri, which had been hyped up to the skies, was actually an error-ridden, limited-feature application. It might be okay for an iPhone app developer to deliver two consecutive flop applications – but Forstall messed up with two biggies like Apple Maps and Siri. The past reputation of the man was waning fast, and he was no longer considered ‘good enough’ for the company. The Cook vs Forstall fight – Sadly for Apple, there was no love lost between Tim Cook and Scott Forstall from the very outset. If anything, the appointment of Cook as the company CEO arrived as a shocker for the latter, who firmly believed that he was the most deserving candidate to take over the coveted mantle. Not surprisingly, Forstall invariably looked for opportunities to find flaws in Cook’s strategies. If Tim Cook had to work in peace without someone constantly watching over his actions, he had to make Forstall leave. That’s precisely what he did. Temper tantrums – Forstall probably believed that his efficiency and ability to ‘think-out-of-box’ would let him get away with his extreme mood swings and temper tantrums at office. Even an usually agreeable person like Jonathan Ive started to hate the sight of Forstall – and often refused to get into one-on-one discussions with him. There were differences in opinions and heated exchange of words with other senior personnel at Apple too. Now Steve Jobs got into plenty of tussles at workplace too, but his was a one-off case – and he was guiding Apple out of a mire. Forstall should not have tried to replicate Jobs in this regard – he was far more dispensable than the great man! Were iOS 5 and 6 good enough? – Talking about innovative thinking abilities, Forstall started losing a bit of that too – during the latter phases of his career at Apple. There were no big technical glitch in iOS 5 or iOS 6 – but they did not have much ‘newness’ about them either. The skeuomorphic designs looked all too familiar with those present in the earlier versions of the platform. This, in turn, opened up the opportunity for competitor firms (like Google) to step in and eat into Apple’s worldwide client-base. Apple Inc. has always prided itself over its premium tech gadgets with volumes of innovative features (think of how the first line of iPhones revolutionized the smartphone sector – and you will get an idea). Mediocrity was slightly creeping into Forstall’s concepts and designs, and that was, of course, unacceptable. Jealousy of co-workers – Scott Forstall was, once, one of the most highly regarded Apple personnel – and he had his fair share of green-eyed colleagues, all too eager to badmouth him whenever possible. To be frank, Forstall compounded this problem further, by angering practically everyone with his words and general demeanor. People started to feel (and often say it aloud) that they could manage Forstall’s projects in a much better manner than him, the feeling of despise hung heavy at Apple – and it became a scenario of ‘Forstall vs All Others’ at the company. No matter how big a genius you are, you cannot alienate everyone at office and still hope to stay there. When the time came, Forstall had to make way. Forstall and his workplace politics – Tim Cook categorically stated that no form of workplace politics would be withstood at Apple under his watch. Forstall, predictably, could not care less – as he carried on his merry way of making use of political tactics for his own advantage. Cook got air of Forstall’s anti-organizational practices – the animosity between the two increased, and at the first chance, the latter was got rid of from the company. Interestingly, most iOS software experts and app developers feel that, even if Scott Forstall had signed the apology letter for the Apple Maps embarrassment – he would still have had to leave the company. John Browett, a relatively new recruit at Apple, was also sacked, along with Forstall. The scenario has completely changed now, and it’s Tim Cook who is in the firing line. Can iWatch turn out to be a rip-roaring success, and save Cook’s career at Apple? We have to wait a few months to get an answer to that!